Environment Minister and Ocean Reef MLA Albert Jacob, Wanneroo MLA Paul Miles and Joondalup MLA Jan Norberger acknowledged the input of residents at community working and reference groups. Mr Jacob initially chaired the working group before the state government committed to extending the freeway to Hester Avenue. The subsequent community reference group, including six original community members, held six meetings between September last year and August this year, chaired by Mr Miles. He said based on the working group’s recommendation, the next stage of the Mitchell Freeway would be from Burns Beach Road north to Hester Avenue, with planning to take it to Romeo Road. The MP said they would build east-west links on Neerabup Road and Hester Avenue, and redo the Wanneroo Road and Flynn Drive intersection. ‘There’s still a lot of work ahead in terms of the planning issues yet to be resolved,’ Mr Miles said. ‘Construction of the next stage will commence in early 2016, with completion by late 2017. 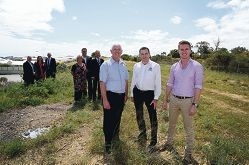 The reference group included the Main Roads project team plus representatives from the cities of Joondalup and Wanneroo.